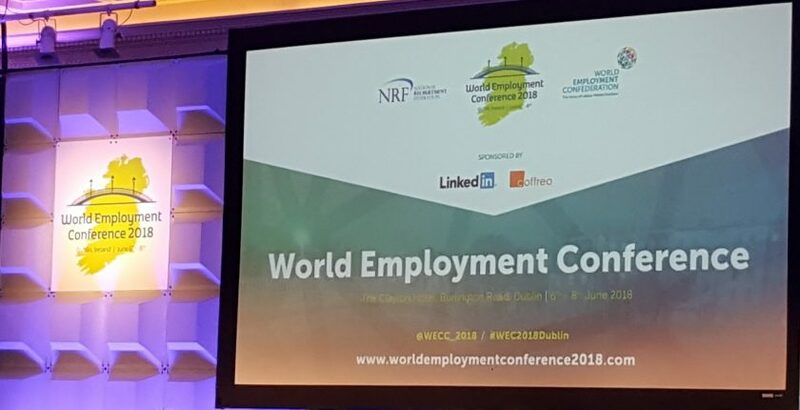 The World Employment Confederation, in association with the National Recruitment Federation (NRF), held the World Employment Conference of 2018, in the Clayton Hotel, Burlington Road, on Thursday 7th and Friday 8th of June. The conference was a massive success with delegates attending from across the world. David McWilliams, an Economist, quoted the great W.B. Yeats and posed the question, “why can the poet see the future more clearly than the Economist?”. His answer was that the poet gives themselves the permission to think unconventionally and so can imagine a future that is different to anything gone before. This was advice that he put forward to us all to embrace. With over twelve breakout sessions to choose from throughout the day, the variety of topics covered was extensive. The theme of the WEC 2018 was “Managing an Extended Workforce” and all the speakers delivered valuable information throughout the conference. Various topics such as the availability of education for those that would like to work in the recruitment industry and how to manage talent in the new world of work that we live in were addressed. The conference not only facilitated a forum for important discussion on the topics of the day but also created a fantastic opportunity to network with recruiters from all over the world. A special thank you to the National Recruitment Federation and the World Employment Confederation for organising a terrific event that was enjoyed by all who attended.